The two sides of the planet Uranus, as viewed in this composite image by the Keck II Telescope at near infrared wavelengths. The bright splotches are clouds. New images of the planet Uranus reveal more diversity in cloud features than ever seen before. The new images, from the Keck Telescope in Hawaii, provide insight into some of the most enigmatic weather in the solar system, researchers said today at a meeting of the Division for Planetary Sciences of the American Astronomical Society. "The cloud features range from small to large, from dim and diffuse to sharp and bright, from rapidly evolving systems to stable features that last for years," said Lawrence Sromovsky of the University of Wisconsin-Madison's Space Science and Engineering Center. A large storm in the southern hemisphere seesaws over 5 degrees of latitude during several years. "It's weird behavior that hasn't been recognized before on Uranus," Sromovsky said. "It's similar to what's been seen on Neptune, although there the oscillation is much more rapid. Sromovsky added that it's not surprising to see cloud features drifting in latitude, but models don't predict the movement. "We don't know what makes it keep coming back to its starting point," he said. The pictures also reveal a long, narrow complex of cloud features that is probably the largest group of atmospheric features ever seen on the planet. Spotted in the northern hemisphere, the 18,000-mile-long complex of clouds dissipated completely over the span of a month. "These more dynamic systems seem to develop at northern latitudes where they rise to even higher latitudes, apparently using up energy and dissipating relatively rapidly," Sromovsky said. The cloud features are being used to trace and help define wind patterns and predict the motions of the large storm systems that sweep across the pale blue planet. 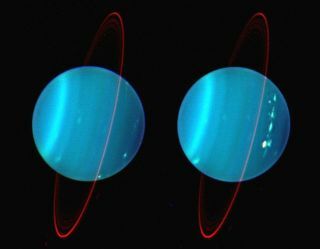 "The large, longer-lived cloud features of Uranus may be underpinned by giant hurricane-like vortices, as we've seen on Neptune," says Sromovsky, "but it's unlikely that they are as violent as the hurricanes that routinely batter Florida, for example." Terrestrial hurricanes are all about taking energy from tropical water and dissipating it farther north or over land. Uranus, which is 19 times as far from the sun as the Earth, has far less solar energy to dissipate. Uranian storms seem to survive and thrive because the atmosphere is "slippery," providing less of the atmospheric resistance that help storms on Earth dispense their energy. "There is very little temperature contrast and very little energy to drive the weather in Uranus," says Sromovsky. "Whatever is happening has to be well lubricated; it has to be a low-friction environment."